This adorable Giggle exclusive is sure to be a literal hit with your little one. Not only is this Bowling Buddies Set of sweet animal pins perfect for lovin’ and squeezing on, but your tot can line them up and knock them down too. Pair your babe up with a worthy peer opponent and let them work on their hand-eye coordination and social skills. The entire set of six animal pins and bowling ball is made from 100% certified organic cotton and is safe for babies 6 months and up. This adorable Giggle exclusive is sure to be a literal hit with your little one. Not only is this Bowling Buddies Set of sweet animal pins perfect for lovin' and squeezing on, but your tot can line them up and knock them down too. Pair your babe up with a worthy peer opponent and let them work on their hand-eye coordination and social skills. 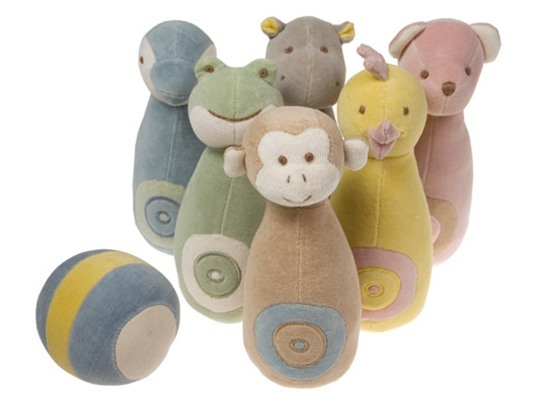 The entire set of six animal pins and bowling ball is made from 100% certified organic cotton and is safe for babies 6 months and up.